Beaming warmth and comfort from above, hanging patio heaters offer a versatile way to cheer up your indoor or outdoor space. Why use a hanging patio heater? Any hanging heater you find on our site is electric and uses infrared technology to generate warmth. 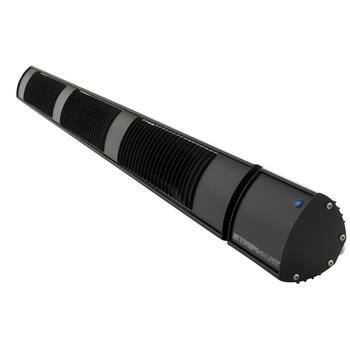 Perfectly suited to indoor, outdoor or semi-exposed environments – the hanging patio heater is one of the most adaptable product categories we offer. 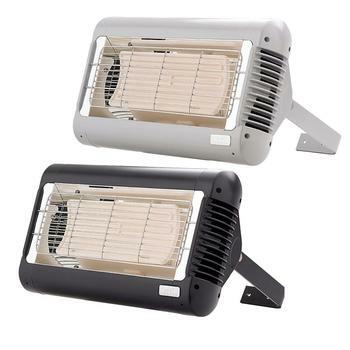 Search our hanging patio heater options via the product links below, or continue reading below the products section to find out more about the top reasons for choosing a hanging patio heater over other types. 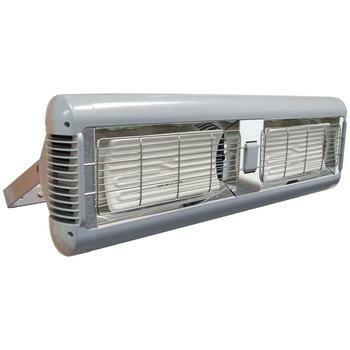 A hanging electric heater is incredibly versatile, and can be enjoyed in all kinds of indoor or outdoor locations. Erecting a gazebo to avoid a sudden downpour? Our 3kW Pendant Gazebo heater produces a subtle, enjoyable level of heat that allows you to eat and socialise comfortably underneath it. If you’re lucky enough to have a decorative, semi-enclosed space such as a conservatory or summer house, a hanging heater could add much-needed warmth without ruining the overall aesthetic. 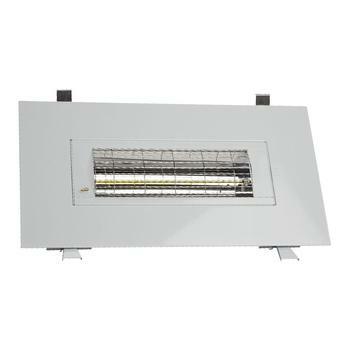 Some hanging outdoor models look more like stylish light fixtures than patio heaters – in fact, some are so cunningly designed, you’d barely notice them! With its discreet shape and dark metallic finish, the Solmagic Pendant Sundowner efficiently warms indoor or outdoor environments while blending in with most surroundings. Also – because it’s electric, rather than gas – the Pendant Sundowner makes no noise, so it will never be a source of distraction. 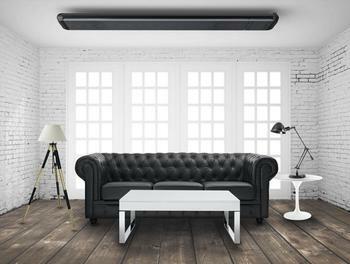 As opposed to floor-standing gas heaters, hanging electric heaters don’t need to be serviced as regularly or have their fuel changed, so they can remain high up at all times. This leaves more room available at ground level and means any wires or electric cables can be kept overhead – out of harm’s way. 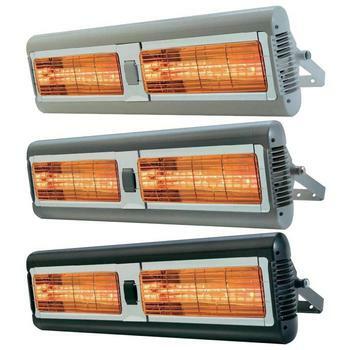 How quickly does a hanging electric patio heater warm up? Unlike traditional gas heating solutions, a hanging electric patio heater produces heat instantly – you never need to feel cold for more than a second! 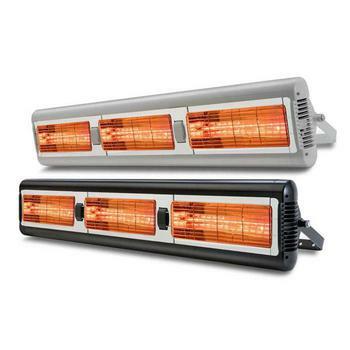 Like the sun, infrared heaters transmit infrared waves straight from their heat lamps towards people and objects in direct range. Rather than warming the air around you (like central heating systems), infrared heat can be enjoyed with the click of a button. 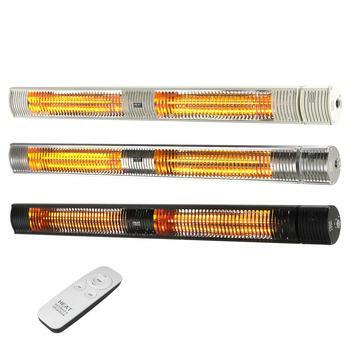 Since the warmth from hanging electric heaters is only felt when it makes contact with skin or clothing, the heat can’t escape or be blown away. 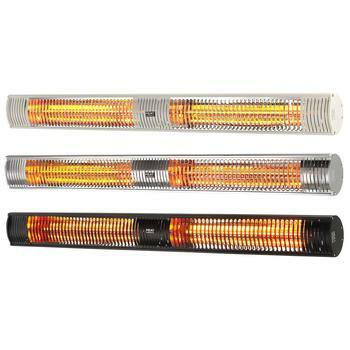 This makes them ideal for use in outdoor environments. 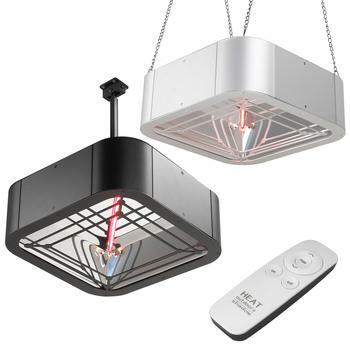 Why choose a hanging heater for your indoor space? A wise choice in any unheated location – from magnificent historic buildings to luxury wedding marquees, a hanging heater never fails to make a positive impact on the ambience of an indoor space. Unlike gas heaters – which are unsuitable for any kind of indoor use – all our hanging models are mains-powered, meaning they don’t produce any naked flames or rely on flammable sources of fuel. Provided that you allow enough space between the heater, the walls and the ceiling (refer to your product’s installation instructions for further details), you can plug your hanging heater in and leave it switched on for as long as you like. 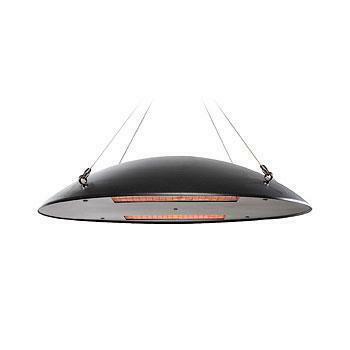 Designed to look like a light fixture, pendant infrared heaters are incredibly subtle and hard to spot. 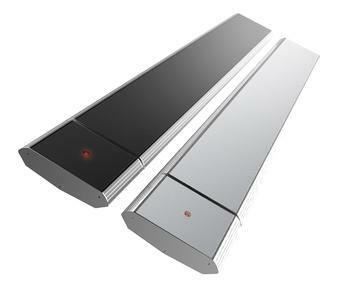 Models such as the Solmagic Pendant Sundowner blend in with almost any architectural scheme. This makes them the perfect heating solution for listed buildings and older structures such as churches, cathedrals and country houses. As with all our infrared models, the Sundowner can also be used outdoors – it brings warmth and style to exterior focal points such as band stands or garden pergolas. 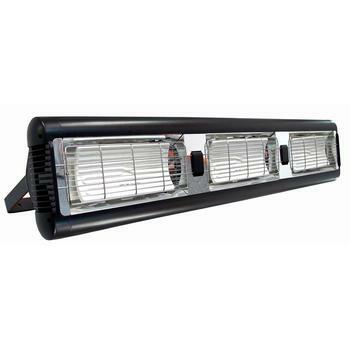 Hanging patio heaters are great for outdoor events – use them inside marquees or festival tents to spread warmth evenly over the assembled crowds. Aside from providing a more comfortable and relaxed indoor climate, a pendant heater brings a touch of interior design and much-needed visual structure to a temporary venue, which can otherwise run the risk of looking bland and uninviting. Enabling you, your family and friends to enjoy your outdoor space for longer – hanging heaters can be a heaven-sent solution to late-night garden parties or breezy barbecue evenings outdoors. 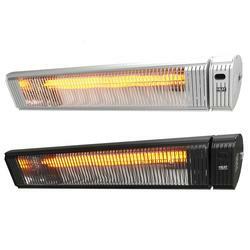 Parties and outdoor family get-togethers are ideal times to use a patio heater, but can they often be crowded affairs. Hanging a patio heater from an overhead outdoor structure saves floor space, providing your guests with a warm and cosy refuge without causing them to trip over or bump up against your appliance. Because they use infrared to generate heat, hanging outdoor heaters are more affordable to run than their floor-standing gas counterparts. 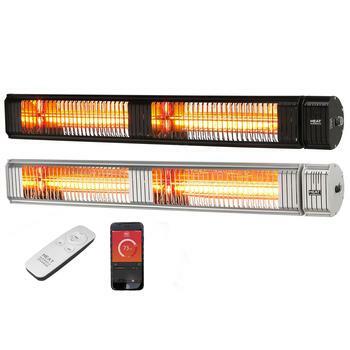 As a general rule, a 600W infrared heater produces about the same level of warmth as a 1.5kW convection heater, so it could be a great way to save money on your fuel bill. This is especially true if you use it often or leave it on for extended periods of time. Our pendant heaters are all built using the highest quality components, so you won’t often need to pay for spares or replacements. 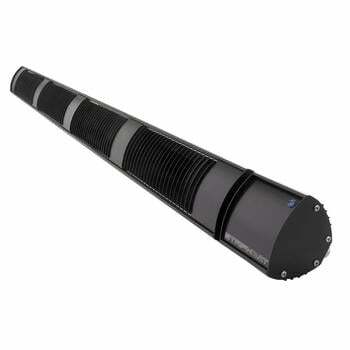 If you’re installing a patio heater in an unsupervised space or public area, you may be concerned about people vandalising or misusing your appliance. Being much harder to reach than a floor-standing heater, a hanging model enables you to pre-emptively avoid malicious damage. Since each of our hanging electric heaters comes with its own remote control, owners can operate them easily without touching the unit itself. This minimises the chance of accidental damage.